It’s Friday. You’re probably kinda tired. So we’re not going to make you do any heavy lifting. We’re just going to tell you about one of the hottest peppers on earth. Which you can cultivate yourself in a beer can. 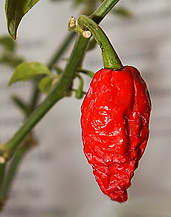 Presenting the Grow Your Own Ghost Chili Pepper Can, your new way to acquire one of the world’s spiciest peppers without flying to northeastern India, available now. Let’s start with a little context. On the Scoville scale, which measures food heat, Tabasco sauce tops out at 5,000 units. These peppers clock in at 1,001,304 units. So yeah, they’re blisteringly hot. And here’s how you’ll grow them. First, you’ll order the package (duh), which comes with the seeds and a container that resembles a soda can, only with little flames and peppers on it. Then, water it occasionally and place it near a good source of natural sunlight (no, your tanning bed doesn’t count). Within two weeks: you’ll start to see sprouts. Several weeks after that: you’ll have up to 70 of your own ghost peppers, aka cobra peppers, aka viper peppers, aka ghost chili peppers. Which you can use sparingly in your tacos. Or judiciously in your buddy’s tacos.